Published in the topical collection Analytical Applications of Biomimetic Recognition Elements with guest editors Maria C. Moreno-Bondi and Elena Benito-Peña. With the advent of the 21st century, public awareness on issues related to human and animal health, food safety, or environmental pollution has increased considerably and a great deal of research and substantial investments have focused on the development of novel tools for clinical diagnostics, food control, or continuous in situ environmental monitoring . Molecular recognition refers to the process by which a specific complex is formed between two molecules; the host is, typically, a macromolecule or molecular assembly, whereas the guest is the target molecule that binds to the former, typically the analyte in this context . At the beginning, this process was primarily based on the use of natural elements such as enzymes, antibodies, nucleic acids, or biological receptors isolated from living systems. Biomolecular receptors show high ligand specificity and affinity, as a result of millions of years of evolution. However, their analytical application is sometimes hampered, among other problems, by their relative instability in non-physiological conditions, the low production yields, or their high cost, together with the social concern raised by the use of laboratory animals. The term “biomimetic” was coined by the polymath Otto Schmitt in 1957 to designate biologically inspired design, adaptation, or derivation from Nature. This word is derived from the Greek word biomimesis, which adjoins bios (life), and mimesis (to imitate) . The development of new molecular recognition receptors, not occurring naturally, that can be engineered and prepared by human beings in the laboratory but mimic the behavior of natural molecules, emerged as an attractive alternative to overcome some of the limitations of their biological counterparts. Synthetic receptors have been defined recently as “synthetic, semisynthetic, or rationally designed biological molecules created with the purpose of selectively binding a single compound or group of structurally similar compounds” . In principle, these artificial materials can be custom designed for a wide range of applications and are characterized by excellent physicochemical stability, durability, ease of storage, and affordability compared with those of biological receptors. Therefore, the ability to develop tailored recognition elements, with a broad structural and chemical diversity, can be expected to lead to an entirely new plethora of applications, not only for biosensing or analytical separations but also for drug delivery, sustained/controlled release of active principles, or environmental remediation, among others. The main groups of synthetic bespoke receptors currently in use include genetically engineered proteins and cells, synthetic peptides, molecularly imprinted polymers (MIPs), supramolecular receptors, oligonucleotides [locked nucleic acids (LNAs), peptide nucleic acids (PNAs)], and aptamers [2, 4]. Moreover, different methodologies, including computational chemistry, combinatorial chemistry, or phage display, have been employed to discover or design new recognition elements for specific targets . The development of biosensors based on nanomaterials and nanodevices has emerged as an exciting area under fast development [5, 6]. New artificial materials engineered to the nanoscale (magnetic, metallic, and silica nanoparticles; noble metal nanoparticles; quantum dots, etc.) can be conjugated with molecular recognition elements, allowing a significant improvement in the interactions with the analyte and generating stronger signal responses. Moreover, the local field effects of radiation on nanomaterials are several orders of magnitude higher than the corresponding bulk effects so that the application of optically active metallic and quantum dot nanomaterials has boosted the development of newer techniques of interest in sensing and bioimaging, such as surface-enhanced Raman scattering (SERS), local surface plasmon resonance (LSPR), metal-enhanced fluorescence (MEF), to name a few. Size reduction to the nanoscale also enables an improvement in the detection speed, a decrease of the sample volume, cost-saving benefits, and an increase in the degree of multiplexing, opening the door to the production of sensing platforms that combine a variety of bio- and biomimetic molecular recognition elements for general diagnostic and detection purposes. However, although nanotechnology-based methods are routinely applied today in the research labs, their use with commercial purposes for clinical diagnosis and medical treatments is still in its infancy . 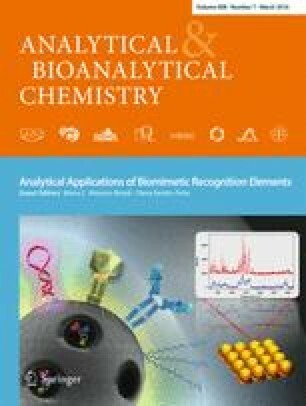 This topical collection of articles gives an insight into the recent advances and future prospects of biomimetic recognition elements in the analytical chemistry field. Research and development in this area has rapidly expanded in the last two decades and the contributors to this topical collection have reviewed the application of peptides, carbohydrates, engineered bacteriophages, and molecularly imprinted polymers to the development of sensors, diagnostics assays, and analytical separations. We would like to thank all the authors for submitting excellent contributions for this topical issue. Thanks to the referees for their careful reviews and constructive criticisms and our deep gratitude to the editorial team of Analytical and Bioanalytical Chemistry for their highly professional and valuable cooperation.